Lower film cost is the main advantage of bulk loading. Lower cost encourages more use. More exposures give more experience and more learning. 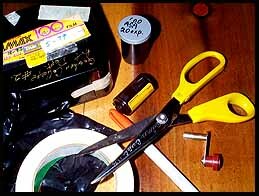 Once you learn how to bulk load film, you may elect to purchase your film already to use if the cost is not a factor for you. We only stock Kodak T-max 100 and T-max 400 in bulk loaders. Other films are purchased in individual roles. Handle the bulk loader carefully. 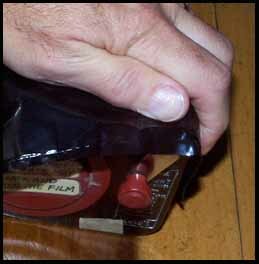 Dropping it can crack the plastic and ruin 100 feet of film. First gather what you will need. You do not need to be in the dark - dim the light. 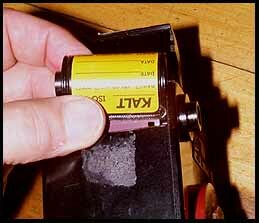 Burnish a piece of tape, sticky side up, to the bottom surface of the film protruding from the bulk loader. 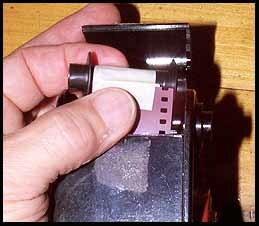 Be careful not to pull extra film out. It is ruined by light. 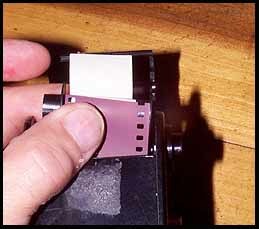 The long end of spool must be to left when film is pointing away from you as shown here. 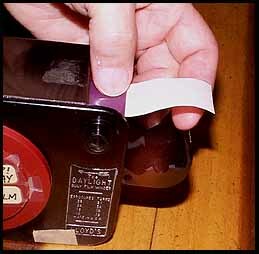 After bringing the tape around the spool, burnish the other end of the tape to the top of the film. 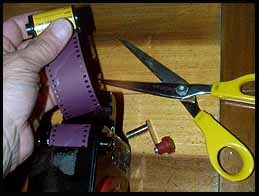 Do this without pulling film out of the bulk loader. 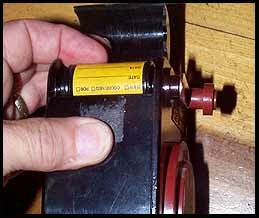 Assemble the cassette over the spool. Be sure the flat area is up. Check the end caps carefully to be sure they are secure. The crank must be all the way in. Close the small door on the bulk loader (on a new bulk loader the door has to be closed before the crank enters). 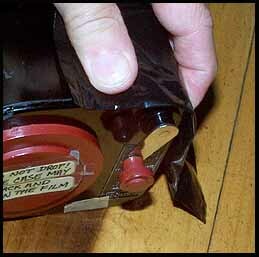 Cover the crack at the top with opaque black plastic. Turn the crank in a clockwise direction. Count the turns following the chart on the bulk loader (21 revolutions makes 20 exposures). Trim and label the leader. Put it in the camera or in a light tight film box. Put everything in its proper place for next time. The above photos were produced with a Kodak Digital 120 camera. 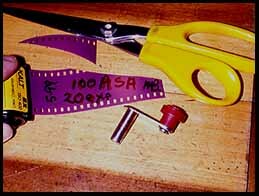 Important - If the bulk loader runs out of film, place a note on the instructor's door, or otherwise notify immediately.